Hotel San Francisco Plaza is the result of the gradual integration of three adjacent residential estates, located in the city center of Guadalajara. The Mexican Colonial-style hotel was originally owned by Francisco Martinez Negrete and his wife Ana Palomar y Corcuera, a wealthy local family. The residences were built during the era of Porfirio Díaz, in approximately 1905. After acquiring the three buildings, architect Enrique Valcárcel, in conjunction with the Instituto Nacional de Antropología e Historia (INAH), completed the remodel and restoration of the hotel in 1985. It began welcoming visitors in 1986. The hotel’s 75 guestrooms are centered around three stunning two-story interior courtyards, filled with fountains, native foliage, and birdcages of colorful, chirping parakeets. Amenities at the hotel include soundproof windows, air-conditioning, cable television, and complimentary WiFi. The family-owned hotel provides warm and authentic Mexican hospitality, coupled with cozy and convenient lodgings. 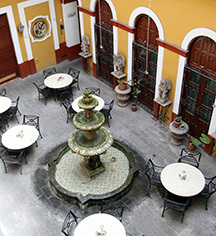 Centrally located in Guadalajara, Jalisco, Hotel San Francisco Plaza is located only steps from the Temple of Our Lady of Aranzazu - a remaining part of the San Francisco convent whose name is the inspiration for the hotel and plaza. From its agreeable location, visitors will find delectable dining, eclectic shopping, and impressive attractions, such as Degollado Theater, Templo de San Agustin, and Plaza de Armas. Hotel San Francisco Plaza, a member of Historic Hotels Worldwide since 2016, dates back to 1896. Three adjacent Mexican Colonial residential estates from 1905 were integrated, remodeled, and rebuilt into Hotel San Francisco Plaza. Hotel San Francisco Plaza is the result of the gradual integration of three adjacent residential estates, located in the city center of Guadalajara. 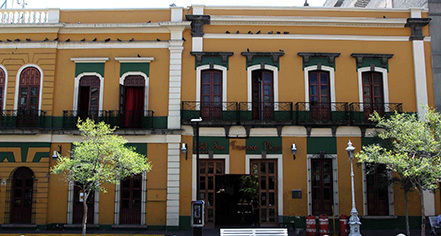 The Mexican Colonial-style hotel was originally owned by Francisco Martinez Negrete and his wife Ana Palomar y Corcuera, a wealthy local family. Learn more about the History of Hotel San Francisco Plaza .